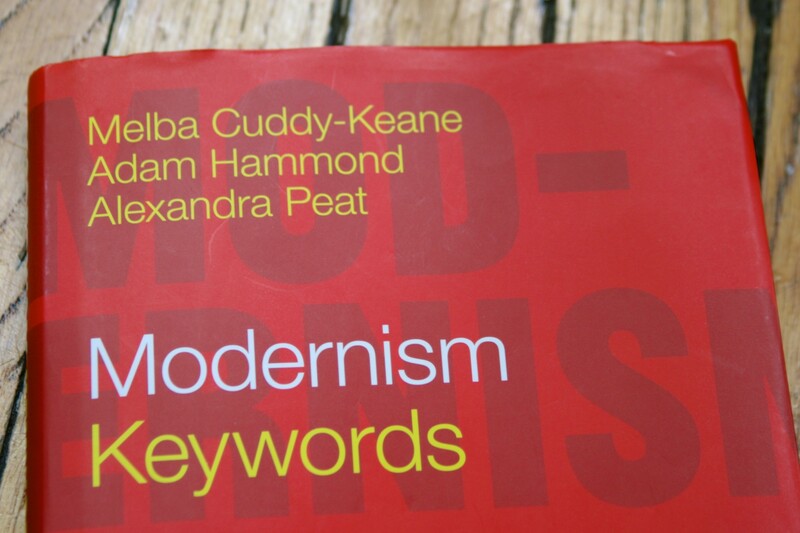 Modernism: Keywords, published by Wiley-Blackwell in 2014, was my first co-authored book. It resulted from a long-term collaboration between myself, Melba Cuddy-Keane, Alexandra Peat, and many others. It whetted my appetite for collaborative humanities research — an appetite that has only grown stronger over the years. Spanning the “long” modernist period, from roughly 1880-1950, Modernism: Keywords tracks words used with frequency and urgency in “written modernism.” The approach takes its inspiration from Raymond Williams’s Keywords: A Vocabulary of Culture and Society (1976), which argued that we can best understand the character and thought of an era not through its dominant beliefs, but through the problems and debates inadvertently revealed in its words. Differing from periodizations that try to identify an era’s dominant ideology, or “the spirit of the age,” a keywords approach identifies controversial words that mattered enough to become magnets of cross-talk and exchange. Unlike dictionaries and glossaries, keywords focuses on words that cannot be easily and summarily defined: words with unstable meanings and conflicting implications, which testify to culture as an active and living thing. Unlike historical dictionaries, keywords goes further than quotation to analyze relationships and to probe the issues or forces underlying ambiguous words. Keywords attempts to discover cultural processes at work. Modernism Keywords will be an indispensable resource from the moment it appears. The work is rigorous in theoretical conception, broad in historical reach, and powerfully revisionary in its implications for modernist study. It falls within the distinguished legacy of Raymond Williams but also applies the most current methods to an expanding archive of modernist texts. Scholars and students at every level will keep it close at hand. Adapting Raymond Williams methods from Keywords: A Vocabulary of Culture and Society to what they call “written modernism,” this volume’s authors construct rich and engaging entries on thirty-nine terms central to discussions of literature, art, and culture that were undergoing contest and transformation in the late nineteenth and early twentieth centuries. The emphasis falls not on what these words mean to us today but on the many, often contradictory, things they meant to those living with the transformations of modernism and modernity. The list of terms runs the gamut from expected entries such as “New Woman,” and “Shell Shock” to more surprising but equally revealing notes on “the atom,” “hygiene,” and “bigness and smallness.” In total, the book uses such detailed historical analysis of terms to challenge limited notions of modernism. The entries are full of surprises, and it’s not the least of the compliments due to this book to say that it is remarkably fun to read. As the editors skilfully trace the multifarious usage of words such as “hygiene,” “primitive,” and “rhythm,” we watch words crystallize momentarily and then spin apart again, both reflecting and propelling cultural and political debates and controversies. […] This is an ambitious and daring book, and one which will undoubtedly make its mark as a research tool and provocative read for students and researchers. In its detail and its disciplinary interventions, Modernism: Keywords represents a challenge to our ways of thinking and reading.